How better to start the autumn season than with a warming pumpkin soup? It is not only delicious and simple to make, but also rich in vitamin A and you will be getting a good amount of fibre, potassium and vitamin E too. Half the pumpkin and remove the seeds (you can roast these later and make a delicious snack!). Slice the pumpkin into quarters and boil or steam them for 15 min. Remove the cooked pumpkin from the pot and keep the water. 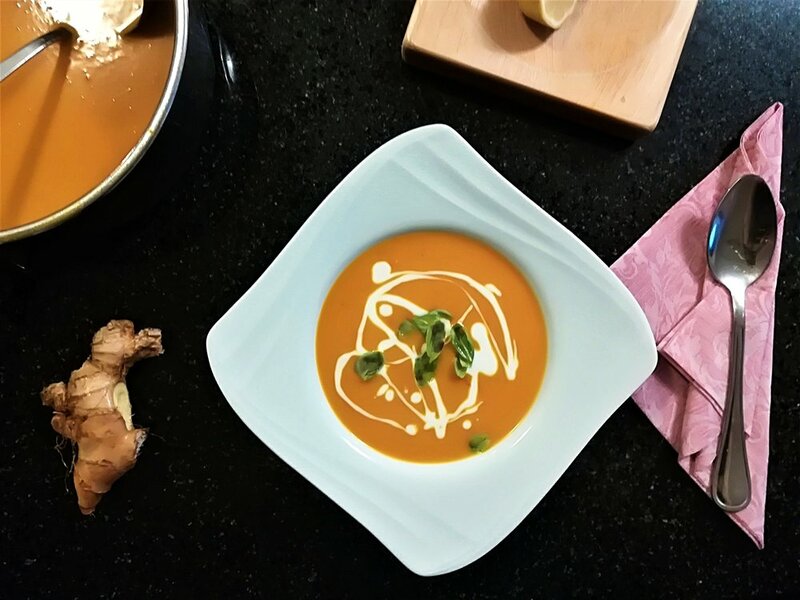 Put the pumpkin into a food processor, add coconut milk (keep 3 tablespoons for garnishing the soup) and blend until you get a smooth texture. In the meantime, heat up coconut oil in a large pan. Transfer the pumpkin mix to the pan, add turmeric, curry, ginger and garlic. If you find the soup too thick, pour in some of the leftover water from pumpkin cooking/steaming. Add pepper and salt to taste. Simmer for another 5 min, garnish with the leftover coconut milk and serve.